The Acer Liquid S2 is a well specified Android NFC smartphone that is capable of recording 4K video. The Liquid S2 runs Android 4.2.2 and offers a 6-inch full HD display, a Qualcomm Snapdragon 800 2.2GHz processor and a 13 megapixel rear camera that makes it the first phone able to record 4K Ultra HD video. A front-facing 2 megapixel camera capable of capturing 1080p video is also be included in the device, along with the latest 802.11ac Wi-Fi and 4G LTE radios. 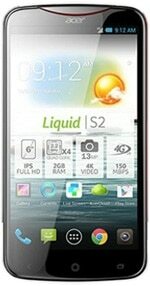 The Liquid S2 was announced in early September 2013 and will be available in red or black from October, with pricing to be announced closer to release.